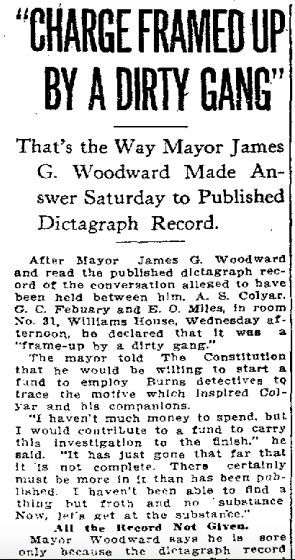 That’s the Way Mayor James G. Woodward Made Answer Saturday to Published Dictagraph [sic] Record. The mayor told The Constitution that he would be willing to start a fund to employ Burns detectives to trace the motive which inspired Colyar and his companions. All the Record Not Given. Mayor Woodward says he is sore only because the dictagraph record did not get all he told Colyar and Febuary in the Williams House room. He says that some part of the conversation is reported correctly, and other parts have been eliminated and words put into the record to fit the aims of the conspirators. “I’ll stand on a drygoods box in the center of the street at Five Points and repeat every word that I uttered in that room,” Mayor Woodward said. “There are some things I said and which were eliminated, which I have stated in print, and which I would like to have in that record as long as they have it. Mayor Woodward denies that the name of Police Commissioner Dozier was mentioned at any time during the conversation while he was in the room. He also denies making the statement that he was “especially after Beavers,” when Colyar made the remark that he had evidence sufficient in convict Beavers and Lanford. “I didn’t mention one word about Dozier deserting Beavers. In fact I did not even know that he was with Beavers. I didn’t mention a word about any one of the commissioners, and I feel pretty sure that the names of Beavers and Lanford were not often mentioned. “I want to make it plain that every statement or report, coming from whatever source, connecting me with the Phagan case, is absolutely untrue and unfounded. Mayor Woodward was asked if he would take steps to have an investigation made of the entire affair.